Saatchi Art’s curators have worked with artists from around the world to hand-pick every artwork we offer on Limited in order to provide you with an unmatched selection of limited edition prints. 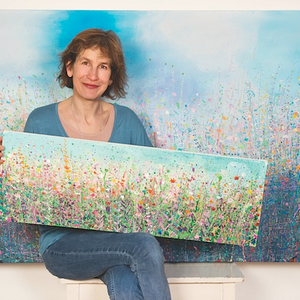 We are proud to offer "English Field" by Sandy Dooley, which is available exclusively on Limited. Artworks in a limited edition have a set number of prints available for each size offered. For the 10x10 size edition, "English Field" comes in a limited edition of only 100 prints. Once all 100 of the prints in this edition size have sold out, there will be no other prints of "English Field" available in the size of 10 inches high by 10 inches wide. Limited edition prints of this artwork may be available in other sizes. The summer months in my garden and local fields are very beautiful, quite gree and colourful. This painting is a response to the summer air, colours and feel of my local enviroment. I love to use palette knives, brushes, to drop paint and use lots of very thin water color like layers to build up a rich textured surface on my canvasses. This 30x30cm canvas is unframed. It has white painted edges and is strung with picture cord ready to hang.